This item is for interior use only. It would make a unique and quirky gift or a lovely, unusual piece for your home. 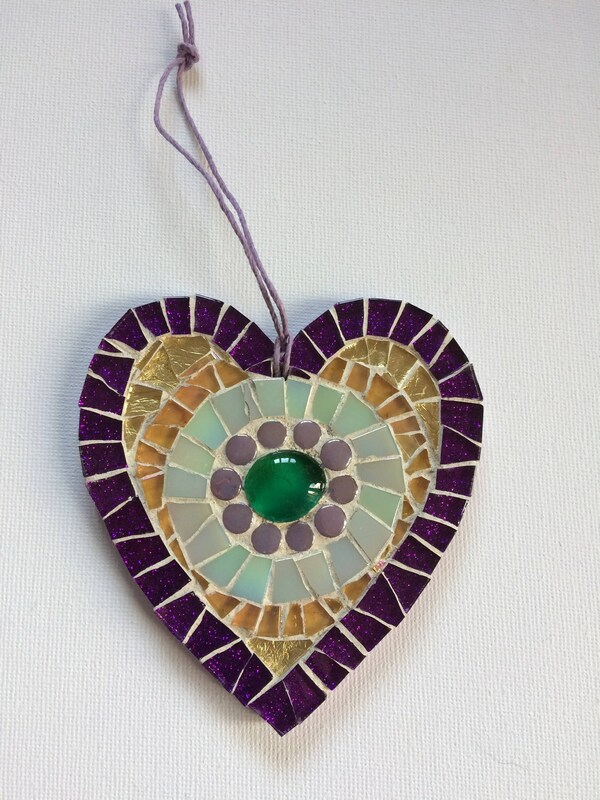 Pretty handmade hanging heart ornament with different shades of purple green gold glass tiles- iridescent glass, glitter tiles and murrini tiles- centred around a green glass stone. The tile pieces all catch the light in different ways which makes the piece really shimmer and shine. Measures 10 cm in height. Made with hand cut glass tiles which are glued onto a birchwood heart template, then grouted in cream. The back is painted and varnished. Complete with coloured hemp cord for hanging. Complimentary gift wrapping (tissue paper and washi tape) on all smaller items. These items can be made to order and custom made depending on colour preference. Please message me to discuss preferences. Although I have taken every effort to avoid sharp edges, this piece is made from cut glass, so care needs to be taken when handling and cleaning (for the latter, a soft dry cloth and window cleaner is advised.